A 3-year irrigation trial provided basic information on the response of persimmon (Diospyros kaki cv. Triumph) water use and development to irrigation levels. Constant experimental factors applied to recommended “baseline” crop factors resulted in ratios of irrigation (I) to FAO56 reference crop evapotranspiration (ET0) ranging from 0.35 to 1.14. Vegetative and reproductive growth, sap flow, stem water potential (SWP), and local climate were monitored. 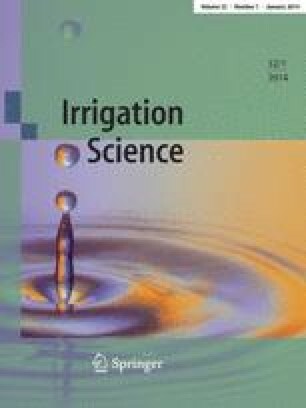 An overall increase in yield and vegetative growth in response to irrigation was found, which suggests a potential yield increase for higher irrigation levels (40 tons/ha for annual irrigation of 1,000 mm). At high irrigation, the yield response curve levelled off and the marginal contribution of additional water declined. The up to threefold increase in number of fruits with irrigation, with no influence on natural abscission, suggests that differences in fruit quantities stem from response to irrigation at the earlier growth stages. Mean fruit size and fruit quality, as indicated by the ratio of rejected fruit, increased with irrigation up to I/ET0 of ~0.8. Relative yield increased linearly with relative transpiration. However, post-harvest quality was not influenced. SWP, sap flow, and non-transpirable water fractions indicated that the seasonal irrigation tables were not well tuned. Initial adjustments were made during the final season of the experiment and a new table was developed based on our results. The new table should be a basis for further trials. Contribution from the Agricultural Research Organization, Institute of Soil, Water, and Environmental Sciences, Bet Dagan, Israel, No. 604/12. Thanks to Avraham Grava and the irrigation crew at Gva’ot Ha’horesh, Israel, for technical assistance. This research was funded by grant no. 304-330-06 of the Chief Scientist fund of the Israeli Ministry of Agriculture and Rural Development.